I know the train tunnel is designed for transit, but this still makes me sad, it doesn't fit. I just got a link to that vehicle not long ago. It wasn't around when that subway vehicle tunnel was created. However, that being said, I will be making freight-train tracks at some point, to service other areas. Obviously subway tunnels won't be good to fit a freight train in, but now that I have access to it, Maybe I can make it fit later-on (possibly, no promises on that, if it doesn't fit in the actual tunnels themselves, not much I can do with that - don't want to undo all the work). 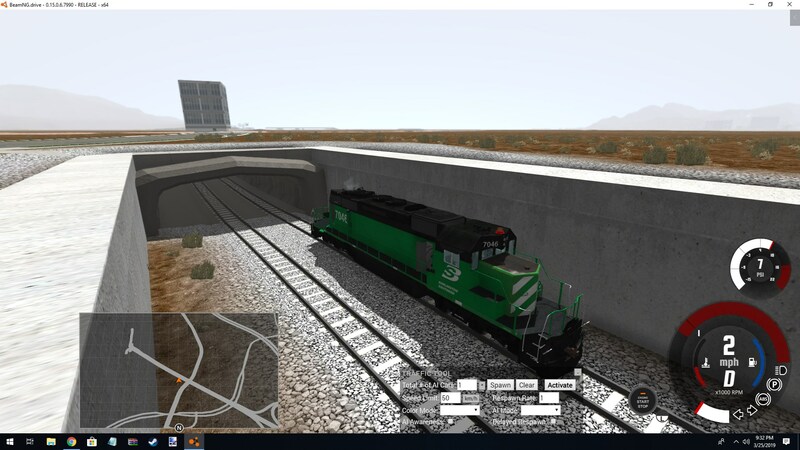 That being said, I will make sure to whip up some new, taller less-rounded train tunnels when the time comes to build freight train tracks into the map. 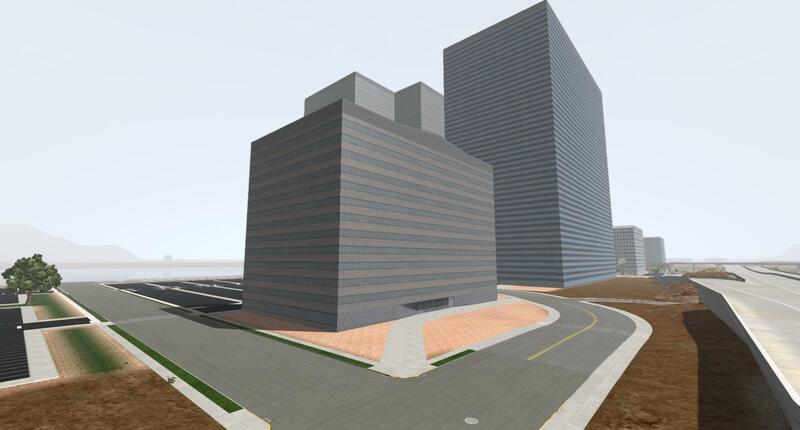 Maybe in the next few days I will be able to post some new commercial buildings here on the forum, as soon as something's far enough along, I will post it up. One will have an integrated subway station that I'll try and make look a little different then the other interior subway stations. HINT: That's also part of why there's a sunken roadway down there not far from the Sea Walls I made and demo'ed. Where the roadway goes underground I'd like to be able to see through to the subway tracks from the road. 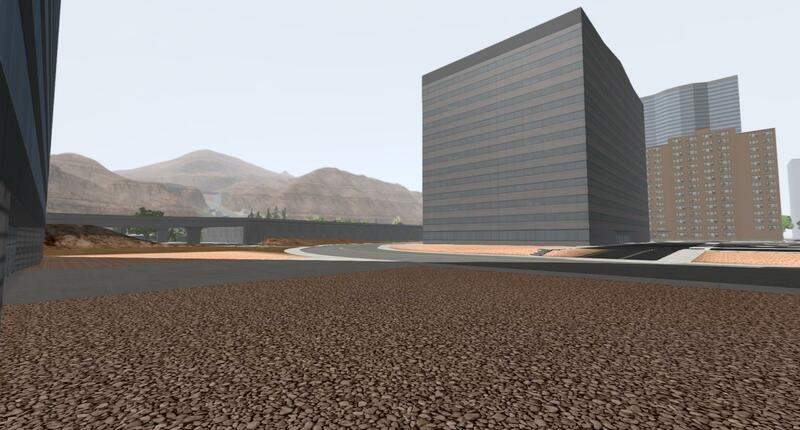 After a bit of a quiet spell, I've got one of the office buildings I am working on close to done. I've included a shot of in Maya, as I am not going to bother with the editor until I get a few of them done & can test-fit them. Skipped out on a flat roof for a slightly-contoured one, for 'something different', to break-up the squareness of the facade (not to mention the downtown skyline) a bit. It's roughly close in size to the white tall building next to the spawn point & tall parking deck, but a bit narrower and taller. Taller buildings to come in the very near future (possibly tomorrow if I don't waste all afternoon putting equipment together for someone, but if so, the day after likely). I will be making another version of this building about 2~3x as tall, in the coming days with a slightly different roof (variation buildings and such will exponentially speed things up, so they don't 'chug' like they've been recently). In other news I finally got a doctor to put me on something that takes the pain out *without* putting me on addictive stuff. Hooray! Now, I don't shake so bad now that I can't hold a mouse right when modeling (it was a bit touch-and-go before, some days good some days bad, now it's much better). Now the nerve shots aren't affecting me nearly as much now, and my back muscles aren't clamping down on my painful Arthritic joints. Spent a half-hour to an hour making a new poured-concrete texture off an existing lower-res texture + hi-fidelity overlays, this will go great for subways or underground parking garages coming in the future. This is just one of the many things (such as making the textures) that takes so much time but never gets noticed, sometimes not even on here. Strongly considering a sunken expressway for part of the town across the lake from the spawn-point. 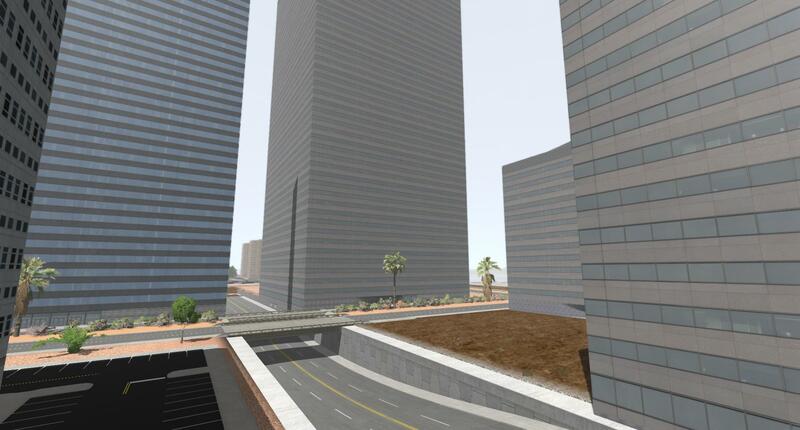 This will give me a chance to add in some Detroit-like sunken expressways through the town. Philadelphia (PA, USA) also has one like this which I had the (mis)pleasure of driving on a few times. Not sure if I will do sloped sides or vertical sides at this point, as that likely won't get started until right after the next beta. Have a sunken expressway near you that you'd like to see in this map? Feel free to find or take some pictures of it, and post a link to them (or post the pictures here) for inspirational purposes. As I'd like to get a variety of roadways and highways in this map, this would almost be required to build into the map (especially being this is a moderately large city). So now that the Roane County update (that hit the repository 5 days ago?) is on the repository (go get it if you haven't), and there weren't any major bugs, and I've been to the doctor and got patched up a bit better, I should have much, much more time to devote to modeling (provided my grass doesn't suddenly realize it's in the mid-60's now and grow a foot overnight). Seriously, go grab the Roane County TN map update and a copy of the Traffic Tool if you haven't yet had a chance to join up with some traffic on Roane County's many miles of highways and rural routes, you're missing out if you don't. Getting personal thanks from the many folks who posted updated reviews of it, and even from the developers made all that work on Roane County totally worth it. For clarification, the 15.2.x version is the most recent one, it's the same whether you got it via Patreon benefit links early (there were two), or the repository here this week / last weekend. I don't believe any of these textures are used elsewhere in the map yet except the concrete trimming just below / at the edges of the roof, and the entry door texture. Only 7 draw calls for the ENTIRE building at max detail - that's very good, but the design IS admittedly simple. There will be much more complex buildings - 'landmark' buildings so to speak, so I need to save 'room' in the draw call budget for those. Trying to put a BETA of *THIS* map out mid-month in April. Should have decent traffic tool capability here too. EDIT: Whenever I figure out missions, that airstrip (which will be a full base eventually) is 100% surely getting a RACE down the runways like the GTAIV RACE MODE race that was at the airport. I LOVED that one, I used to run RACE MODE servers back in 2009~2011 4~5 times a week for hours a day. Click the picture below to expand. Will this map be reposed into the Mods category? 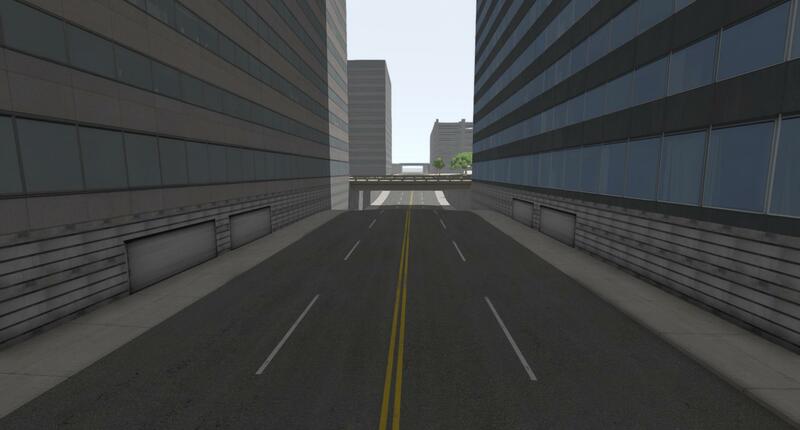 Remember that this is a very early demo of what the map will be. Yes it will eventually make it to the mods category, eventually. That may still be a few months away unfortunately, but things are just starting to pick-up progress-wise here, especially now that the doctor patched me up with stuff to make me slightly-less-cripple now - and what a world of difference that makes! Nope it doesn't have nearly enough buildings to be Los Angeles, but Los Injurus will be a huge city. I am cranking out buildings currently and almost have a second one finished up now tonight, after making one last night. It will get there, it just takes time, lots and lots of it. The road network is already in for the highways (most of it's done up to close to what it will be, or nearly finished), the surface roads need a lot of placement yet, but they'll go in as the buildings go in. The important thing about this is that everyone knows the true reason for this map. That reason is so that I can create and master the Modular Road Kit, a lego-like kit that fits together so that you can CREATE YOUR OWN CITY in the map editor. So that pretty much anyone and everyone will be able to make a city for themselves. I will just supply the pieces in a separate kit (or you can use the ones that come with the map). 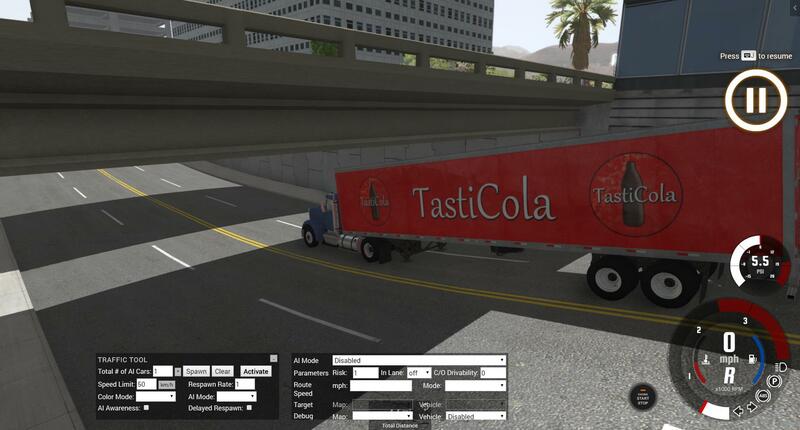 BeamNG has a real lack of decent city maps, and my Roane County with it's mesh curbing that likes to snack on tires isn't exactly the most-desirable thing out there, though it's huge and quite a time-sink, even if you're not the mapper. So entirely, there's going to be a lot coming in 2019. I will be posting pictures of building progress tomorrow some-time, failing that, over the weekend I'll make sure to get something posted. Is this available for download yet? The Train picture at the beginning of this page shows someone using it. no, unless you donate to him. Yes, exactly. However, I am physically disabled and on a fixed income, so that money goes to pay for the 100's of dollars in software that I've been paying for over the last year. Maya is a monthly fee, and I even managed to get enough to get a copy of World Machine 2 v3000 in the last couple of months. It's only the 'indie' license, but that's plenty fine for what I need to do. Professional textures (when I am not making them here, I try to make what I need 1st), a sound-stage for the map (which it doesn't have yet, almost there! ), that all costs money. 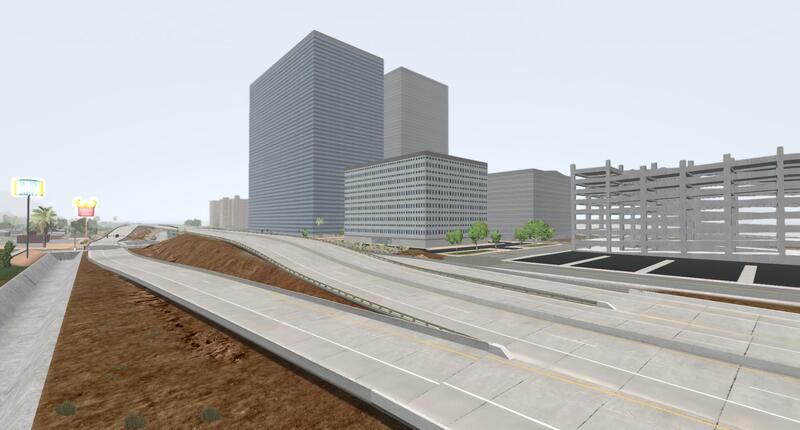 If I get enough, I might even buy a super-fancy completed pre-made non-derelict mall to drive through (But I am hesitant because it might not be worth it, models can be hit or miss). There's already a derelict two-floor stripped-out mall you can drive through, though. So entirely, while there's plenty to find and drive around in/on in this map thus far, it's still FAR from finished. Things have just been picking up lately now that I've finished Roane County TN map's update (which sorely needed it for almost 6 months, eek!). So do stay tuned if you're on the fence, and read the 1st post on this thread for links to the Patreon if you feel like donating. The next Patreon links for this map will go out in roughly two weeks, mid-month or so. If anyone got on the Patreon and doesn't have a link to this map yet, give me a shout-out if I'm not doing my job well enough (I am not perfect). I hope this paragraph answered any questions you may have. More building buildings tonight, and there will be no 'April fools' rubbish from me on my threads, so if I happen to post buildings or something tomorrow, don't feel like you're being fooled. A little too old for that here. Had a lot of storms after I was done cleaning out / reorganizing in the garage Saturday since it was 71F here (hooray!!! ), so I couldn't get a lot done last night (don't work during storms because here in Bedrock, the power goes out a LOT during storms, I'm out in the boonies). It didn't quit storming from 8pm to 2am or so aside of a few quiet spells for a few minutes. I left the PC off for a few hours, so it doesn't go KA-BOOM when the house gets hit 'yet again' by lightning. I used to have a APC UPS system back when I had my 1st house about 15 years ago, but it burst into flames in-front of me one time, so none of those, as I don't feel like running out of the house with yet another burning appliance in my hands. Not the 1st time, probably not the last - so when the weather is bad, I don't get a lot done, but I don't have to play impromptu fireman either. Yet another bit of 'life's tips' from The Bob. Use it well (that's so tacky, I had to). 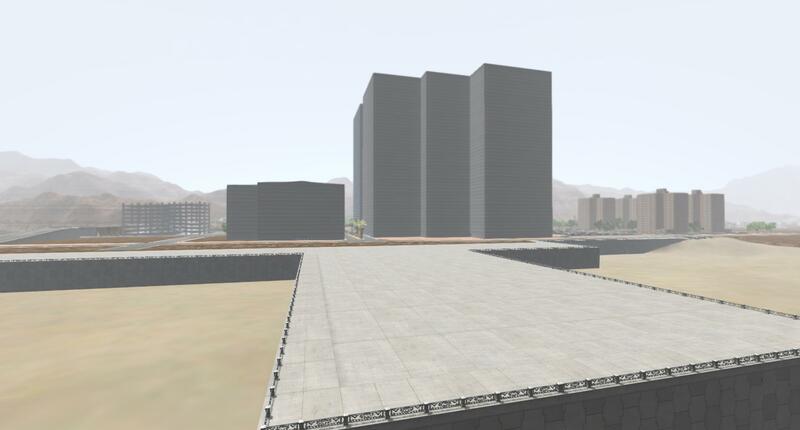 If anyone has any large residential or commercial building requests, please post pictures of them, as that's what I am spending the next two weeks doing, aside of buggering with the AI lanes a bit for Traffic Tool reasons. Houses (single-family homes) submitted months ago will still get done when I do houses again, as I do several 'variations' of them when I do them, just like commercial buildings (that's the way you model buildings), so that you get the most for your time spent. A pair of 50-story buildings now obliterates the skyline, though these won't be the tallest buildings in the city, though. 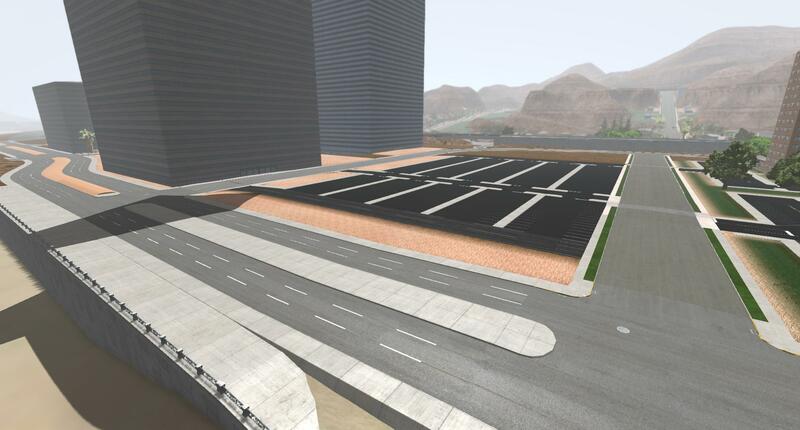 While the lower road IS unfinished, it's been updated to four lanes, and has access for the lower parking levels (those are the large bay doors, not able to be entered currently). Should be a bit of fun to drive down there going quickly, as you'll catch just a bit of air. The lot is more finished now, and all the grounds nearby are leveled off much better, there will also be trees in the future here - not too many to block the view though. 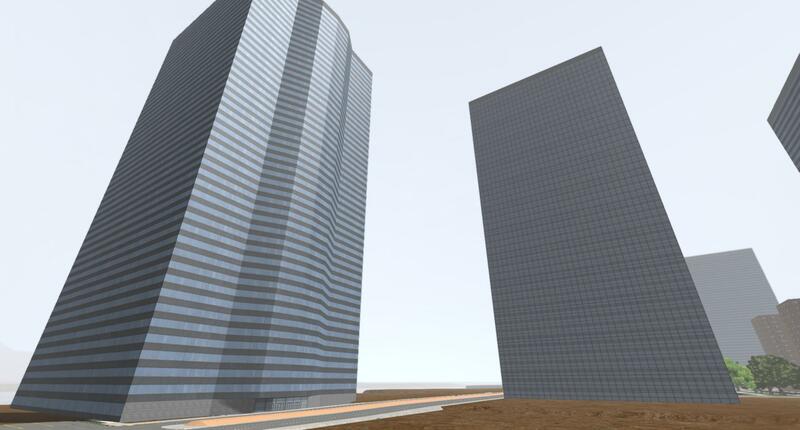 This is not all of the buildings I made, there's another pair of buildings I won't be showing yet until they're in. Keep in mind this area is about half-finished in the pictures - no signs, poles, street lights except what exists already by the highway, no bushes or plants etc (again except what already was placed). 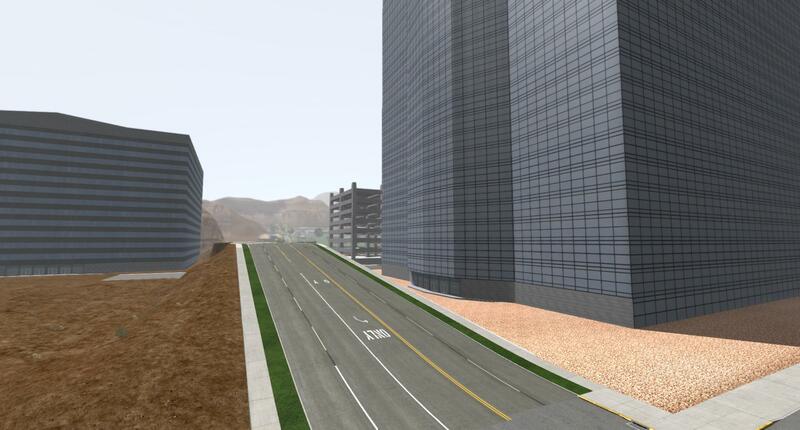 The unfinished lower road between the sky-scrapers will connect to a tunnel that will tunnel under the city for a few blocks. A view from the high hill above the spawn point, at the 'lookout'. It's slowly starting to look like a city now, Hooray. Sorry, guess I am a spoil sport; but there's no April Fools jokes from me, as stated previously. Despite that I hope you all enjoy your April 1st and don't get pranked too bad. EDIT: checked to make sure the truck fits, it does! Are you using gray shade of texture and coloring it in materials.cs with diffuse color anyplace? That I think is kinda neat way to get numerous different colors, devs used that in Italy I believe. I do that on high-res building textures, but not ones with the windows already in them, as that doesn't always work out too well. That can save on memory though. 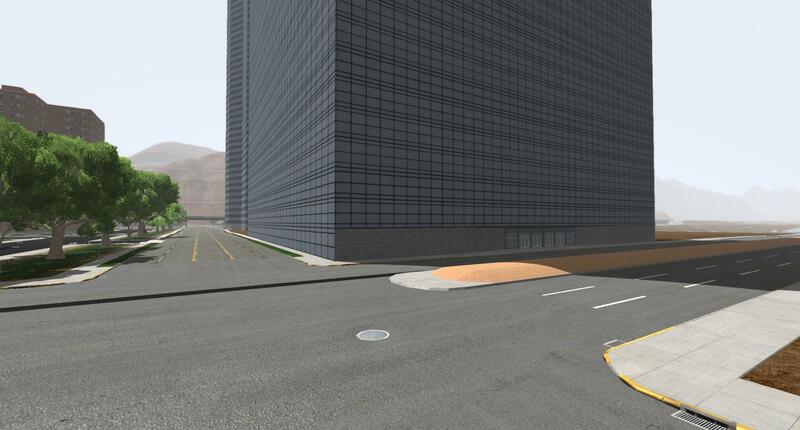 I often do that stuff with road textures, though, as it works better that way in the long-run, and is great for matching 'color aging' of road asphalt, as it bleaches with the sun. Things like concrete blocks, bricks, stone or marble building facades, tile (floor and wall), carpet, wood tones, yes it's wonderful for all that stuff though. On other news, I have a *LOT* of work to do to get traffic tool function good on this map, but it's known, and will be addressed before the next beta (it may take a few betas to fully iron-out everything). Again, this is not meant to be a replica of Los Angeles, nor is it complete yet, so it still lacks for now as it's work in progress. Some sections will be like Los Angeles, some sections might look more like run-down Detroit or the rust-belt, other places might look like the south, another portion might look a bit more like Utah/New Mexico/Nevada, etc, it's all about where in the map you are. There's going to be a bit of everything here but the main theme is 'Western-most USA' such as Los Angeles and it's nearby Desert areas. TLDR, it's supposed to just be a HUGE city, really. That's what it's billed as. 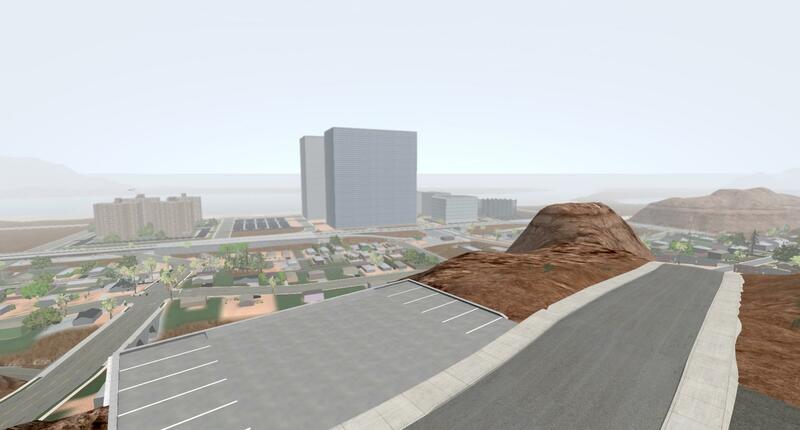 I've already made 'The biggest map in BeamNG' and quite possibly also 'Map with most miles of paved road', which Roane County takes the cake for, so it's time for 'The Biggest City map'. This map will be good for all sorts of matters! Like screenshots, movies, realistic crashes, etc. Can't wait for the Beta to be released. Keep up the good work. A building much like the one from yesterday (yes, this one I intended to put there all along but didn't have time last night)... Pardon the lots looking a bit plain yet, that is known. Two new 40-floor buildings above (not 50 floor like the others), with rounded faces on two sides. There's also a partial shot of a 13-floor office building that's new in the 2nd shot above. Again, aside of the 1st shot, these lots are no-where near 'done', not even close even the 1st shot is maybe half furnished. They need more lots, lots of greenery / plant-life and general nearby road furnishings. The tunnel I mentioned yesterday is still not in, but maybe it will get there tonight. 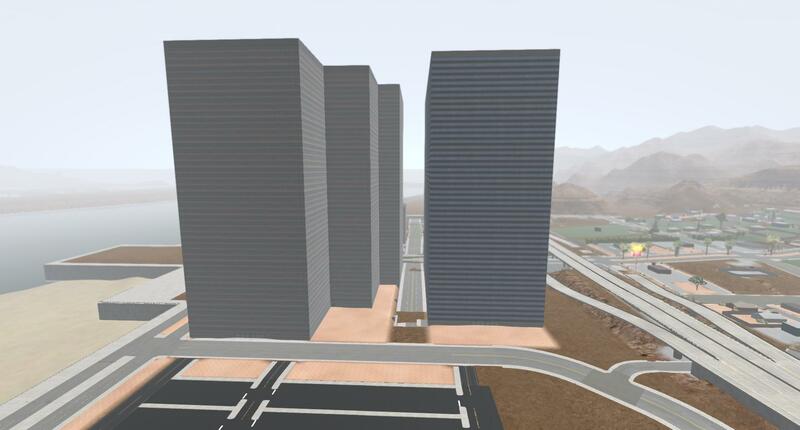 As I said, once I start whipping up buildings, they go fast; but don't worry, they won't ALL look so similar, different sections of town will always have different (and likely also a few of the same) buildings. I will do my best not to make this city look like the "ever-repeating backgrounds" of an old-time Hanna-Barberra cartoon - where they go past the same mountain / tree & bush / rock-pile many many times in one direction. @davidinark I know you'll entirely know what I mean by that and so will @fufsgfen . Heck I picked that out when I was 10, but I was rather observant for a 10-year-old around 1991~1992 or so. 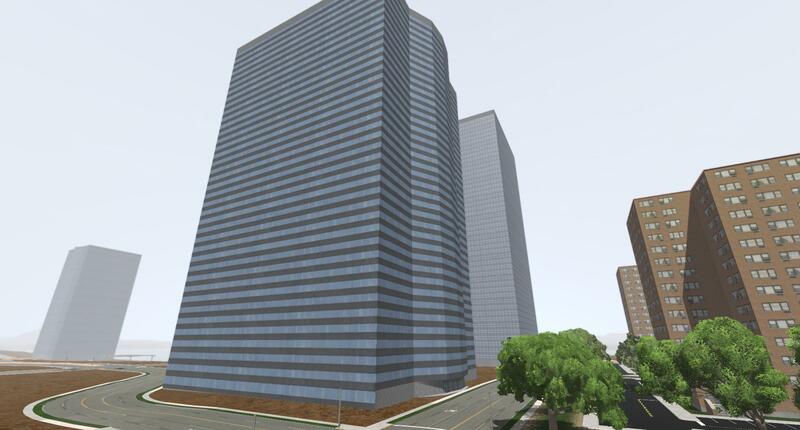 *The new texture, and many of the other commercial building textures don't yet have fancy specular or normal-maps yet, or anything reflective or illuminating (for night-time) yet. They're just in enough that they work. When I get further along, before I go finishing up the lots, I will get those all fixed, as the BC7 format texture exporter I use does things in bulk. That's why they look 'flat' and super-smooth. I will get it fixed up soon enough in the coming week or two. We're roughly two weeks from the next beta release. If you've recently joined on to this map's Patreon (thank-you! ), and you don't yet have a copy of the last beta that hit before I did Roane County's beta, please message me on Patreon and I will make sure to get it to you ASAP (I check every few days on there, or at-least twice a week). If it goes a few days and you don't hear from me, or you don't wish to wait, message me on here about it, with your Patreon user name, and I will send a link via Patreon message system. All that said, I hope folks are more happy with the progress, and I am pretty darn sure you will be once the lots are done up nicer & fuller. We still need updated Roane County reviews with the Traffic Tool in action, so if someone can pest @davidinark , maybe pest YBR too while we're at it, and anyone else who does BeamNG stuff, that'd be fantastic as I'd love to have something awesome to put on the resource page. --More posts tomorrow or the day after.